New York: Avon Books, 1982. 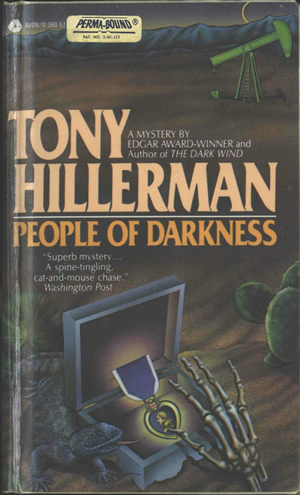 This is the Avon paperback edition of People of Darkness, the fourth novel in Tony Hillerman's Navajo mystery series and the first novel featuring Sergeant Jim Chee of the Navajo Police. The cover is uncredited but features an illustration of a desert scene with the skeleton of a human hand reaching into a box containing a Purple Heart medal. A lizard, a nopal cactus, an oil pumpjack, and a mountain skyline also feature in the illustration.